Neff, a German manufacturer of household appliances, presented itself and its new premium line on the occasion of the trade fair “A30” at an exceptional place – the Kaiserpalais in Bad Oeynhausen, Germany. 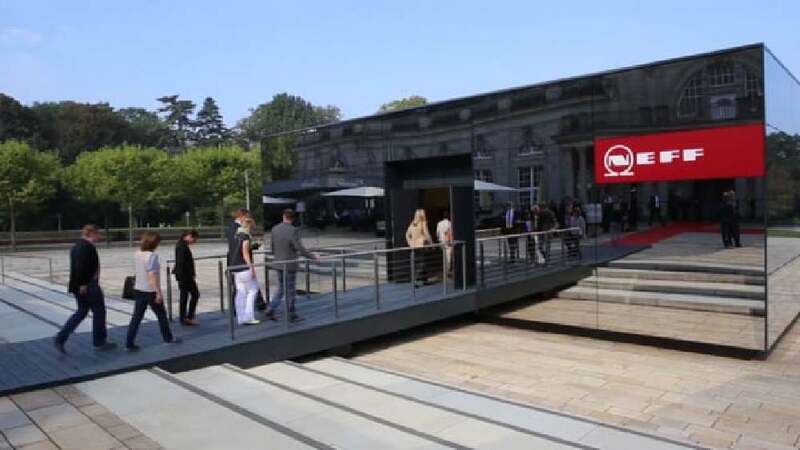 The new premium line was to be introduced to the public in a temporary pavilion with 180 sqm of exhibition space placed on the palace forecourt. The challenge was to develop an exhibition design that could enter into an exciting dialogue with the historic building and its structure. The solution was a cube with three reflecting sides, morphing its appearance while visitors approach, from mirroring the palace to merging with its surroundings. In contrast to the multiply reflected palatial exterior, the interior of the pavilion welcomes visitors with a clear, minimalist yet premium-quality exhibition space design that puts the modern kitchen devices centre stage. The temporary exhibition pavilion fascinates in how it merges with the environment despite its size, by reflecting both the historic buildings and the park landscape. The idea of integrating such an exhibition pavilion into the public space is as simple as it is astounding. The cube exudes a quiet and peaceful appeal with an interior that optimally directs visitors’ attention to the modern exhibits and underlines the manufacturer’s high design standards.